Outdoor go karting in Milton Keynes is the ideal solution for drivers wanting to forget about all of those endless roundabouts! 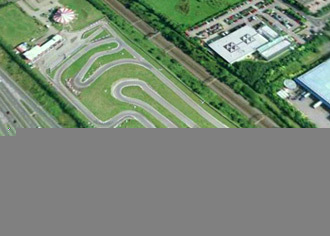 The track is certainly an impressive looking kart circuit and conveniently situated in the heart of the town. At 1360 metres it's also one of the longest in the UK and the 390cc Sodi karts (or DMax karts if you’re experienced) will impress you with their speed. The track offers a range of events to suit most requirements and your event will be professionally run by the experts. A selection of standard events are shown below but further race formats for larger corporate groups are available upon request - please call for details. Ten minutes qualifying to determine your grid position followed by a non-stop 20-minute race. For groups of drivers with karting experience; 125cc Water-cooled, 2-stroke Rotax-Max karts. Practice plus a 20-minute non-stop race. A 90-minute team endurance event. Qualifying to determine your grid position then a non-stop 90-minute relay event for teams of 2 to 4 drivers sharing a kart. This event is non-exclusive and open to the public.